Houses & Homes VA: Which is worse? Losing your glasses or losing your keys! Which is worse? 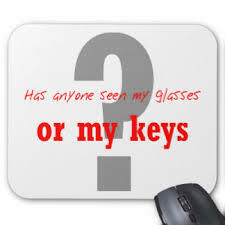 Losing your glasses or losing your keys! We all lose things from time to time but what is the worst thing you’ve ever misplaced? For most people I would think it would be a tossup between keys or eyeglasses. I mean, if you can’t find your glasses you can’t see anything but on the other hand without your keys you can’t drive, get into (or leave your home) or anything else. On one hand you’re blind but on the other hand you’re either locked out of your own home or a prisoner within it! Still, I imagine there are worse things to lose in the scheme of things. Imagine losing the winning 10 million dollar lottery ticket or indisputable proof of who actually shot Kennedy! What if you had discovered the cure for cancer and lost the formula or the plans for a working free energy machine that would provide electricity to everyone in the entire world for no cost? Yes, I think it’s fair to say that it is possible to lose something even more valuable than our keys but I would imagine this type of thing doesn’t happen very often. Timing is important too. Misplacing one’s car keys Sunday evening before bed time is one thing; not being able to find them when you are already late for work is quite another! Once I misplaced a recipe while right in the middle of cooking the meal. Well, maybe “misplaced” isn’t the correct term for what happened. One minute it was sitting on the counter top and the next it was gone. To this day I have no idea where it went to but I strongly suspect it is in the same location as the missing socks from my dryer. In either event, when we lose something can be just as important as what we lose. So what’s the most important thing you’ve ever lost? Keys? An important contract? Your child’s 10 page book report for school? I’ll bet there are a million different stories out there and I’d love to hear about them. That is, of course, unless you’ve recently changed your computer password and lost the piece of paper that you wrote it on!